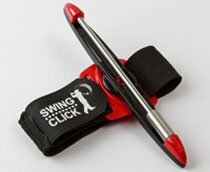 The secret to great rhythm is finishing your backswing and the key to finishing your backswing, is knowing where the top of your swing is, on a consistent basis. 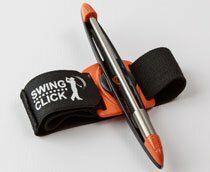 The SwingClick PLUS will help you with both. Great transition is the key to consistent ball striking. By smoothing out your transition and finishing your backswing, you create time in your swing for your club head to get back to square at impact, resulting in more consistent ball striking. 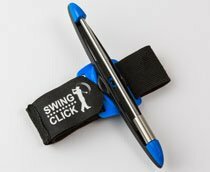 The NEW, 2nd generation Swingclick PLUS has a sleeker design that complements the natural flow of the swing. 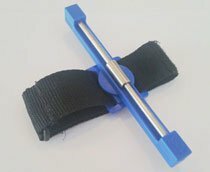 The strap is more adjustable and flexible, making it one-size-fits all, and it is available in four different colors – blue, red, orange and purple. 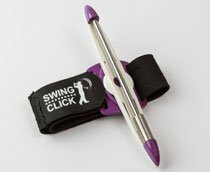 It can be twisted so that you can set it for your individual backswing.